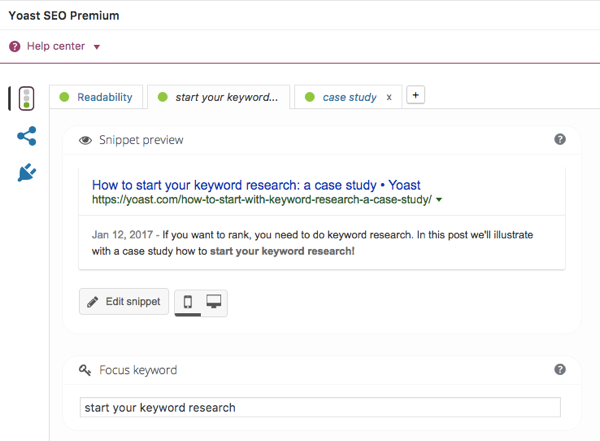 As you might know, we’ve added quite a few new features to Yoast SEO over the last few months. Today marks the release of Yoast SEO 4.1, the first of many releases to come in the new year. Besides fixing some bugs, this version comes with two major new features: a mobile snippet preview and full support for the German language in the readability and content analysis. Not only does full language support for German allows Yoast SEO 4.1 to analyze the readability of a German text, but it also enables Yoast SEO Premium to provide internal linking suggestions in German. This means that, when writing a post in German, you will get suggestions for related articles on your site, that you could consider linking to. Building a perfect site structure has never been easier. Fun fact: To fully understand the post and to give valuable suggestions, we have to filter out unnecessary words or other words that get in the way of discerning the meaning of a post. For the English language, we use a long list of words that we’ll automatically filter out. For German, it seems we needed an even longer list because of the grammatical cases. Check this example: In English it’s “a”, “an” and “the”, while the German language has “das”, “dem”, “den”, “der”, “des”, “die”, “ein”, “eine”, “einem”, “einen”, “einer”, “eines”. See what we mean? We can’t wait to see what the Dutch language has to offer.